EduPedia Publications grants you a limited license to access and make personal use of this site and not to modify it or re-use it, or any portion of it, except with express written consent of EduPedia Publications Pvt. Ltd.
EduPedia Publications Pvt. Ltd provides this website www.edupediapublications.com and associated websites and services to you subject to the following conditions. In visiting edupediapublications.org or associated websites you accept these conditions. EduPedia Publications Pvt. Ltd grants EduPedia Publications Pvt. Ltd account holders a limited license to access free content on EduPedia Publications Pvt. Ltd and paid subscribers access to agreed content, for personal use but not to modify or re-use its contents, or any portion of it, except with express written consent of EduPedia Publications Pvt. Ltd. EduPedia Publications Pvt. Ltd retains the right to remove access to free content. When the paid subscription period ends, access to content, aside from any free content, is removed and any caching must be removed. In visiting EduPedia Publications Pvt. Ltd you are agreeing that any disputes that arise are subject to Indian Law. At EduPedia Publications Pvt. Ltd we endeavour to make all the information on our websites, and especially that relating to our products, as accurate as possible. However, EduPedia Publications Pvt. Ltd does not warrant that product descriptions or other content of this site is accurate, complete, reliable, current, or error-free. If you buy a product from us that you are unhappy with, your sole remedy is to return it in unused condition. All content included on this site, such as text, graphics, logos, page headers, button icons, images, audio clips, digital downloads, data compilations, and software, is the property of EduPedia Publications Pvt. Ltd, and is protected by international copyright laws. Consequently, EduPedia Publications Pvt. Ltd’s trademarks may not be used in connection with any product or service that is not EduPedia Publications Pvt. Ltd’s in any manner that is likely to cause confusion among customers, or in any manner that disparages or discredits the company. The provision of links to other websites or locations is for your convenience and does not signify our endorsement of such other, websites or locations, or their contents. Because EduPedia Publications Pvt. Ltd has no control over, does not review, and cannot be responsible for, these outside websites or their content, you acknowledge and agree that EduPedia Publications Pvt. Ltd is not responsible for these resources. Additionally, EduPedia Publications Pvt. Ltd is not responsible for the availability of such third party sites or resources, and does not endorse and is not responsible or liable for any damages resulting from use or transactions related to such sites or resources. Because EduPedia Publications Pvt. Ltd does not control such content, you agree that EduPedia Publications Pvt. Ltd is not responsible for any such content, including advertising and information about third party products or services. Furthermore, EduPedia Publications Pvt. Ltd does not have control over such Content and makes no guarantees about the accuracy, currency, suitability, or quality of such content, and assumes no responsibility for unintended, objectionable, inaccurate, misleading, or unlawful content made available by third parties. Every purchase you make from EduPedia Publications Pvt. Ltd via this website edupediapublications.org is made subject to a shipment contract. This means that the risk of loss and title for such items pass to you upon our delivery to the carrier. Therefore, it is your responsibility to ensure that any contact information/delivery address you have provided to Packt Publishing is both accurate and up-to-date. Failure to ensure these details may result in your order being delayed, lost, or un-delivered, and PEduPedia Publications Pvt. Ltd cannot be held responsible for instances where incorrect details have been given. Lastly, PEduPedia Publications Pvt. Ltd reserves the right to refuse service, terminate accounts, remove or edit content, or cancel orders at our sole discretion. This site is provided by Edupedia publications Pvt. Ltd on an “as is” and “as available” basis. Edupedia publications Pvt. Ltd makes no representations or warranties of any kind, expressed or implied, as to the operation of this site or the information, content, materials, or products included on this site. You explicitly agree that your use of this site is at your own risk. To the full extent permissible by applicable law, Edupedia publications Pvt. Ltd . Disclaims all warranties, express or implied, including, but not limited to, implied warranties of merchantability and fitness for a particular purpose. Edupedia publications Pvt. Ltd does not warrant that this site, its servers, or email sent from Edupedia publications Pvt. Ltd are free of viruses or other harmful components. Edupedia publications Pvt. Ltd will not be liable for any damages of any kind arising from the use of this site, including, but not limited to direct, indirect, incidental, punitive, and consequential damages. EduPedia Publications Pvt. Ltd reserves the right to make changes to this site, policies, and these Conditions of Use at any time. If any of these conditions shall be deemed invalid, void, or for any reason unenforceable, that condition shall be deemed severable and shall not affect the validity and enforceability of any remaining condition. EduPedia Publications Pvt. Ltd may immediately suspend or terminate your access to the Site without notice if any breach of these Terms and Conditions of use by you is brought to our attention. • EduPedia Publications Pvt. Ltd reserves the right to make changes to the books’ format availability at any time and for any reason so long as a copy of the eBook remains available elsewhere. 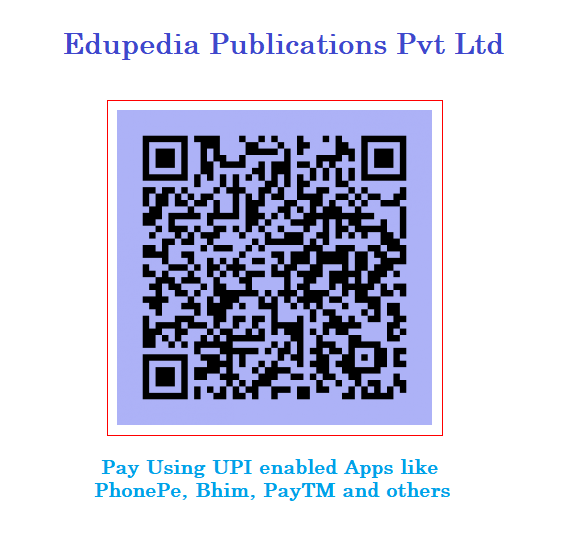 • All products listed and sold via this application are copyright ownership of EduPedia Publications Pvt. Ltd, and making illegal copies of your ebook files will be considered a breach of copyright, against which legal action will be taken. • EduPedia Publications Pvt. Ltd’s eBook files are safe for download and do not carry any malware that could harm and/or damage the purchaser’s eReader/computer/device or smartphone. However, all eBook files are bought at the purchaser’s risk, and purchasers should take the necessary steps to ensure the safety of their eReader, computer, device or smartphone. • That the purchaser is solely responsible for the storage of any physical and downloaded content, and that EduPedia Publications Pvt. Ltd cannot be held responsible for the loss of eBook files or any of our products, after their initial receipt, i.e. purchases are held at the purchaser’s own risk and that accidentally deleted/damaged files cannot be replaced by EduPedia Publications Pvt. Ltd. The sole exception to this rule being purchases which are held on the EduPedia Publications Pvt. Ltd web app where a technical fault/unforeseen error has occurred with the app or the eBook. In this instance, EduPedia Publications Pvt. Ltd shall make any previously purchased eBook(s) available to the purchaser as soon as is practical to do so and once any fault or error has been rectified. All content on Edupedia Publications sites and blogs is for informational purposes only. “Edupedia Publications” blog is not responsible for and expressly disclaims all liability for the interpretations and subsequent reactions of visitors or commentators either to this site or its associate Twitter account or its Facebook account. Comments on this website are the sole responsibility of their writers and the writer will take full responsibility, liability, and blame for any libel or litigation that results from something written in or as a direct result of something written in a comment. The nature of information provided on this website may be transitional and, therefore, accuracy, completeness, veracity, honesty, exactitude, factuality and politeness of comments are not guaranteed. This blog may contain hypertext links to other websites or webpages. “Edupedia Publications” does not control or guarantee the accuracy, relevance, timeliness or completeness of information on any other website or webpage. We do not endorse or accept any responsibility for any views expressed or products or services offered on outside sites, or the organisations sponsoring those sites, or the safety of linking to those sites. Comment Policy: Everyone is welcome and encouraged to voice their opinion regardless of identity, politics, ideology, religion or agreement with the subject in posts or other commentators. Personal or other criticism is acceptable as long as it is justified by facts, arguments or discussions of key issues. Comments that include profanity, offensive language and insults will be moderated.